He had words. I don’t. I will miss your intelligence, honesty, passion, and respect for cultures different from your own. Thank you. Rest in peace, Anthony Bourdain. 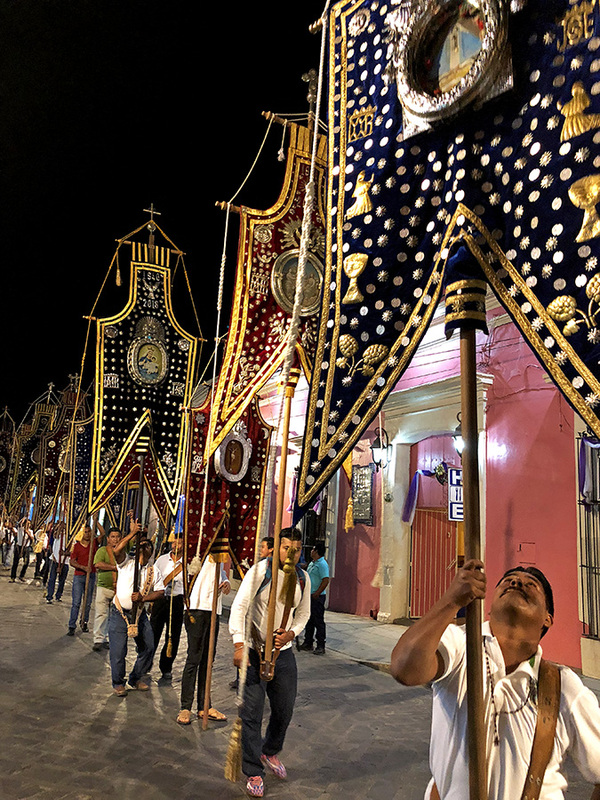 Semana Santa (Holy Week) is in full flower in Oaxaca, the streets are filled with tourists, both domestic and international, and the city is very helpfully distributing a schedule of the most important activities for this Easter season. Thus, on Tuesday evening I walked down to Independencia, which had been blocked to traffic, for the Procesión de Estandartes (Procession of Banners) — leaving from the Basílica de La Soledad and arriving at the Cathedral, a few blocks away. 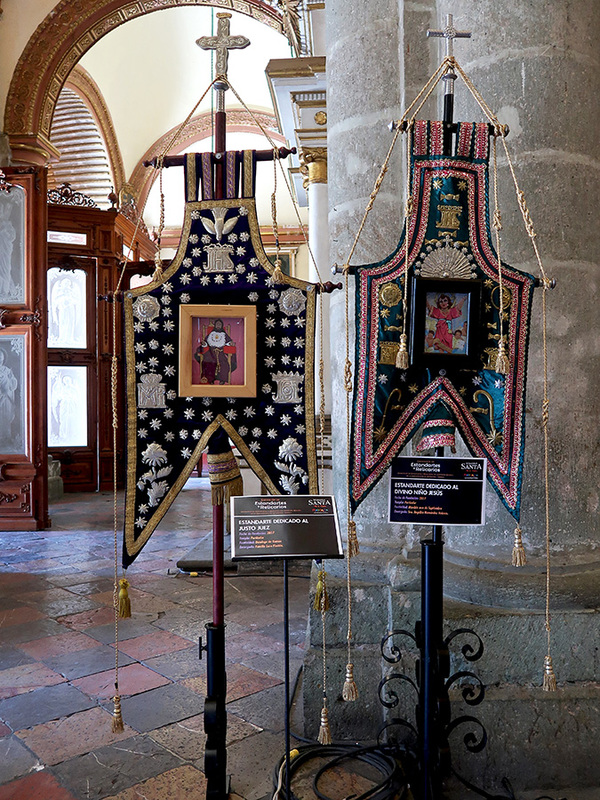 The banners were carried by the members of the hermandad del Santísimo Rosario (Brotherhood of the Most Holy Rosary) and numbered well over 100. 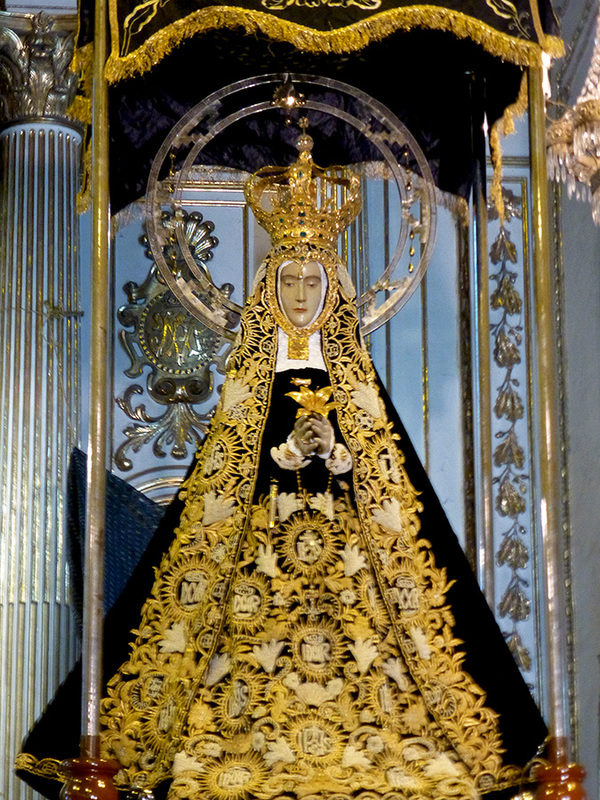 In addition, the Chinas Oaxaqueñas de Casilda carried an image of Nuestra Señora del Rosario (Our Lady of the Rosary), the patron saint of the brotherhood. 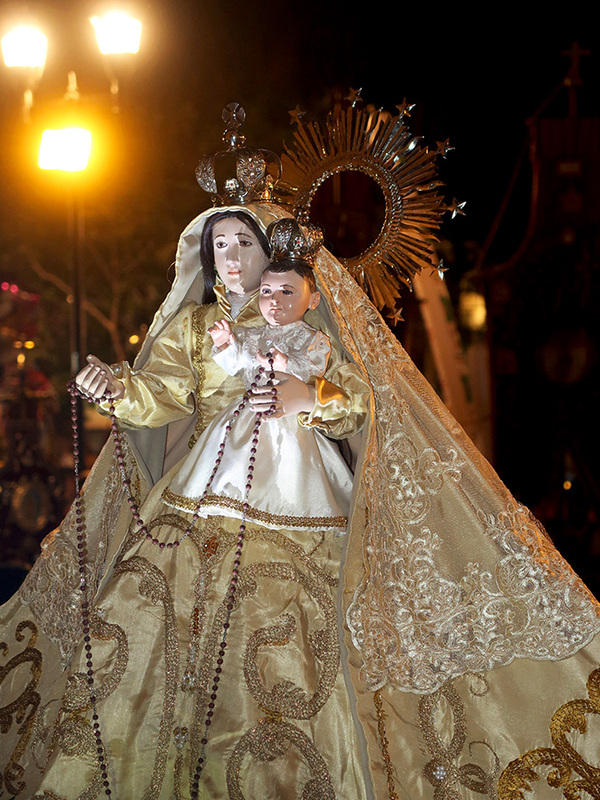 Once all the banners had reached the plaza in front of the Cathedral, the way parted for Our Lady of the Rosary to enter the Cathedral. 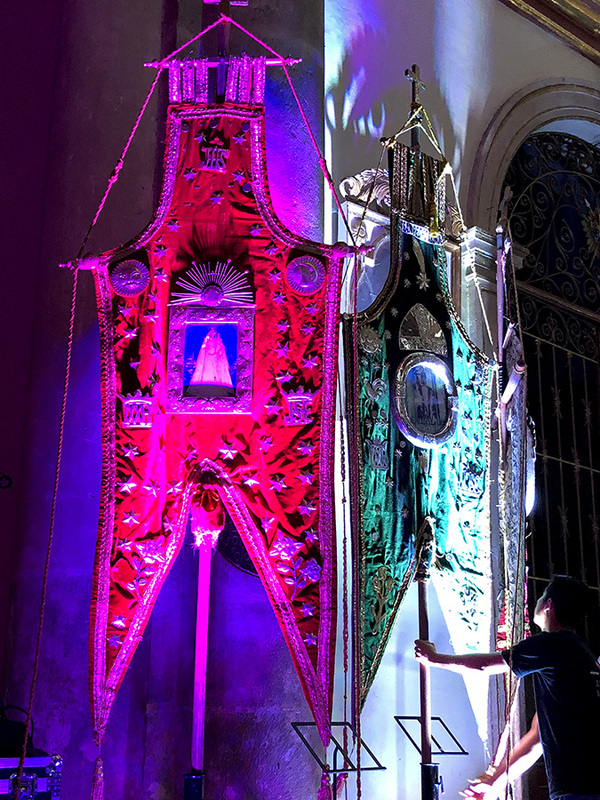 The banners followed and were carefully positioned next to special lighting along the aisle walls on either side of the Cathedral. It was quite stunning! An hour-long choral concert followed — nothing like listening to sacred music under the soaring ceiling of Catedral Metropolitana de Nuestra Señora de la Asunción. They had even installed video monitors, so all could see the orchestra and singers. I returned to the Cathedral the next day to view the banners “up close and personal” and discovered informational labels had been placed in front of each estandarte — listing the date made, affiliated church, church festival, and the sponsor of the banner. 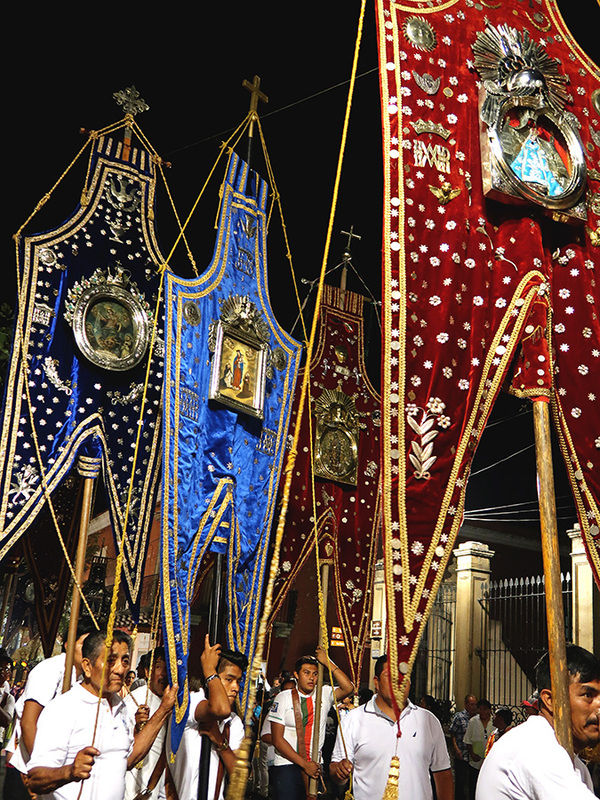 They will once again hit the road late tomorrow afternoon to join Good Friday’s, Procesión del Silencio (Procession of Silence). 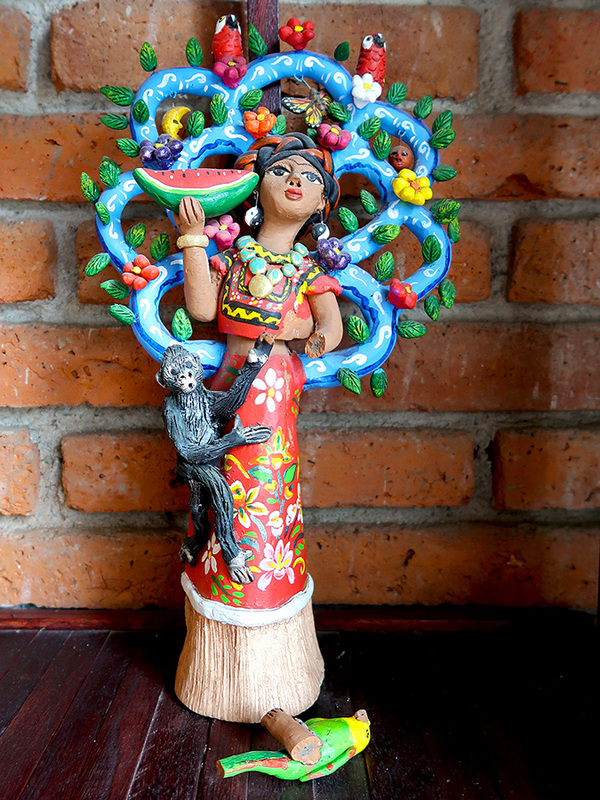 Ceramic sculpture of a Tehuana by Fran Garcia Vásquez. Ooops, a broken arm! It seems appropriate that my only casualty from the 8.2 earthquake depicts a woman from the Isthmus of Tehuantepec — the region where some of the most severe damage in the state of Oaxaca occurred. However, like the people she represents, she is strong, proud, and healing will happen. If you want to help the victims of the September 7 earthquake, please see my previous post. If you do, reward yourself by watching last night’s benefit at the Guelaguetza Auditorium, Oaxaca Corazón. And, if you don’t, perhaps this spectacular concert will encourage you to donate to earthquake relief. This all-star event, organized in less than a week by Lila Downs and Susana Harp, will have tears falling — I guarantee it! To watch last week’s Desfile de Delegaciones (Parade of Delegations), Donají…La Leyenda, and both the morning and evening Guelaguetza performances at the Auditorio Guelaguetza on Cerro del Fortín: http://www.viveoaxaca.org/2017/07/EnVivo2017.html. This week, the same link should be live streaming tonight’s Desfile, tomorrow night’s Donají, and both Guelaguetza performances on Monday. If not, check the CORTV TV en Vivo link: http://www.cortv.oaxaca.gob.mx/tv-en-vivo/. How many of us knew that eighty years ago, in the midst of the Spanish Civil War, children of Spanish Republicans, facing the danger posed by the fascist government of Francisco Franco, were provided refuge in Mexico by President Lázaro Cárdenas? 463 children sailed across the Atlantic Ocean, landing in Veracruz on June 10, 1937. After a being warmly welcomed, these child refugees were put on a train to Morelia. Most never returned to Spain. In the brief interview below, one of the still-living refugees, 87 year-old Amparo Rius Munoz, offers lessons for today. The documentary, The Children of Morelia – Crossroads and Perspectives will be shown at the Festival Internacional de Cine de Morelia (Morelia International Film Festival), October 2017. As the last couple of posts hinted, this year, instead of the city, I spent much of Semana Santa (Holy Week) in one of my favorite places — Teotitlán del Valle. This was only the beginning. It was a colorful, moving, and delicious experience! The headline in the New York Times reads, She Showed Up Yearly to Meet Immigration Agents. Now They’ve Deported Her. For eight years, Guadalupe García de Rayos had checked in at the federal Immigration and Customs Enforcement office here, a requirement since she was caught using a fake Social Security number during a raid in 2008 at a water park where she worked. Every year since then, she has walked in and out of the meetings after a brief review of her case and some questions. Despite a night of protests and a legal appeal, this 35-year old mother of two, who has lived, worked, and played by the arbitrary U.S. Immigration and Customs Enforcement (ICE) rules — and who hasn’t lived in Mexico since she was 14 — was separated from her husband and children and dropped off in Nogales, Mexico early this morning. I’m so sad and angry at the mean-spirited and grand-standing senselessness of it all. Right now, all I can do is cry and post this heartbreaking music video, Ice El Hielo by La Santa Cecilia. Y’all feeling safer up there in el norte? 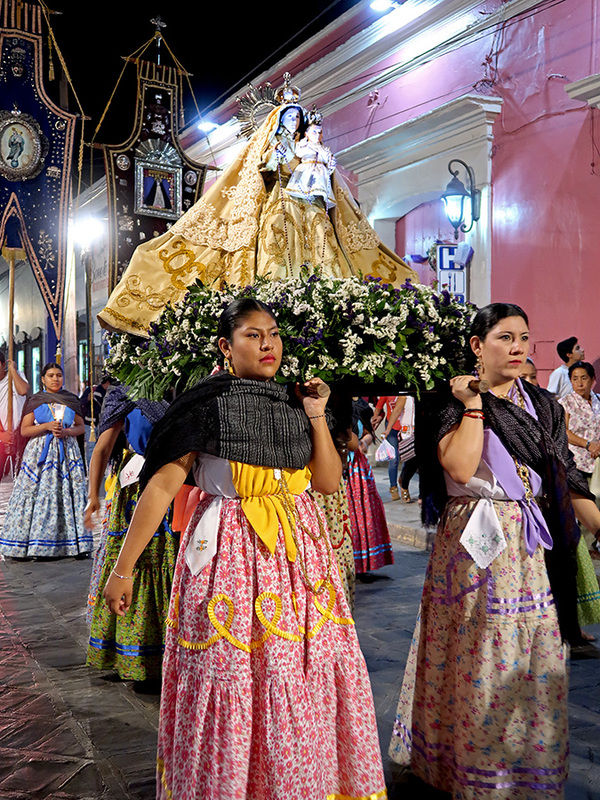 Nuestra Señora de la Soledad is the patron saint, queen, and mother of Oaxaqueños — and she is my vecina (neighbor). Thus, I shall not want for revelry! Despite her name, there is no solitude for Soledad or her neighbors on her December 18 feast day — or the days and nights leading up to it. Like her sister December virgin images, Juquila and Guadalupe, she seems to thrive on the cacophony that is fiesta life here — after all they are Mexican Marías. So, bandas playing traditional music (loudly), fireworks and rockets booming and banging, church bells urgently chiming, and lively recorridos (travels) through the streets of the city, beginning early in the morning and continuing well beyond midnight, are welcomed. 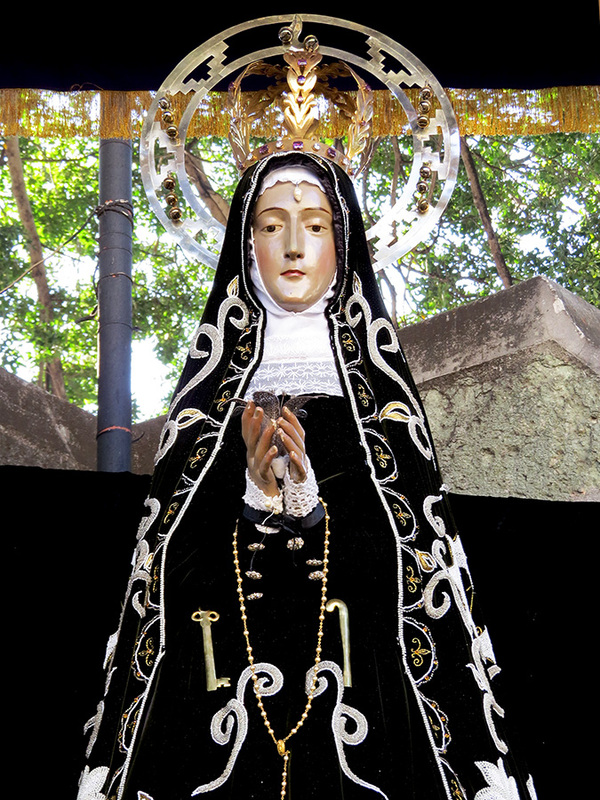 The celebrations began at 5:00 AM on December 7, with a ringing of church bells and a “dawn journey” and culminated with a grand fiesta yesterday, December 18, her feast day. She seemed to enjoy the festivities, including these guys from the Istmo performing for her, *La Danza de los Negros. Soledad’s fiesta will end tomorrow (Dec. 20) with a concert of Christmas carols at 7:00 PM. It’s been great fun, but I’m already looking forward to Noche de Rabanos on December 23! *La Danza de los Negros is another of those complex and multilayered dances traditional to specific indigenous cultures in Oaxaca. 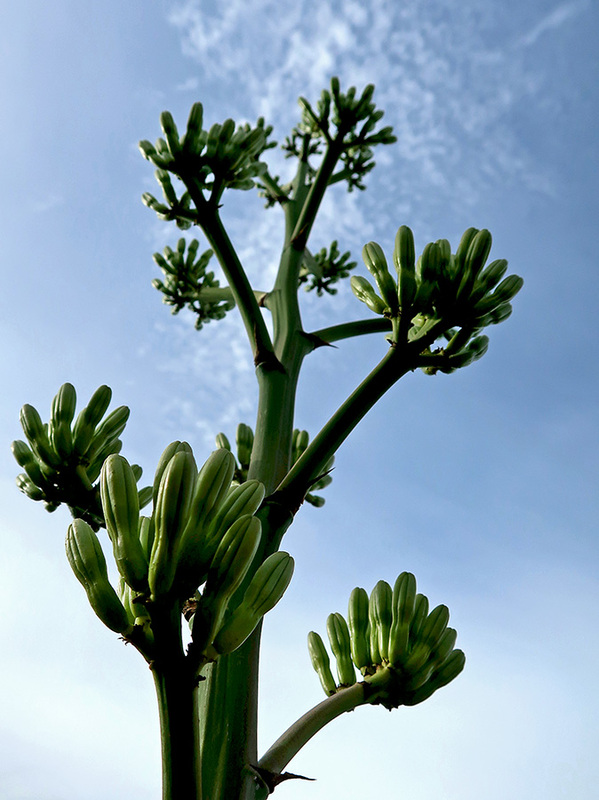 For more information, check out the article (en español), Los Negros, tradición bixhahui, ícono de Chihuitán. 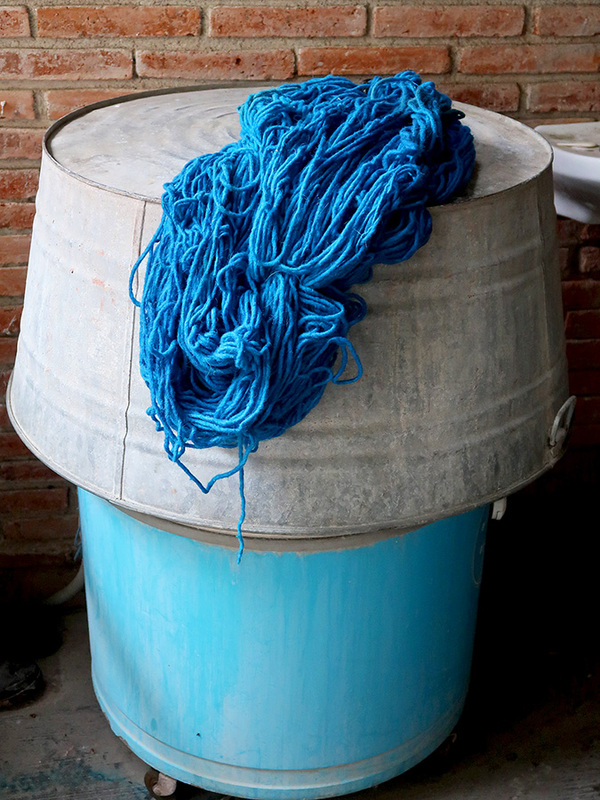 As regular readers know, I have a huge soft spot in my heart for the people and cultural traditions of the Zapotec village, Teotitlán del Valle. Blogger buddy Chris and I go out there often, especially for their major festivals where the Danza de la Pluma is performed. Earlier this month, a new group of danzantes de promesa assumed the sacred 3-year commitment to perform the Danza de la Pluma and, for the first time in recent memory, they were selected to dance in this year’s official Guelaguetza. As you can see from the Vive Oaxaca video below, their 17-minute performance Monday evening was spectacular! ¡Felicidades! to the band, Los Reformistas, led by Maestro Antonio Servando Bautista González; to the breathtaking dancing of Sergio Gutiérrez Bautista (Moctezuma), who was front and center and flawless during the entire performance; and to all the Danzantes, who impressively executed the complicated and visually stunning choreography of Maestro Javier Gutiérrez Hernandez. While I may only be a (albeit, frequent) visitor to Teotitlán del Valle, I couldn’t help but feel incredibly proud of the dancers and the way they represented their strong, vibrant, and historic community. 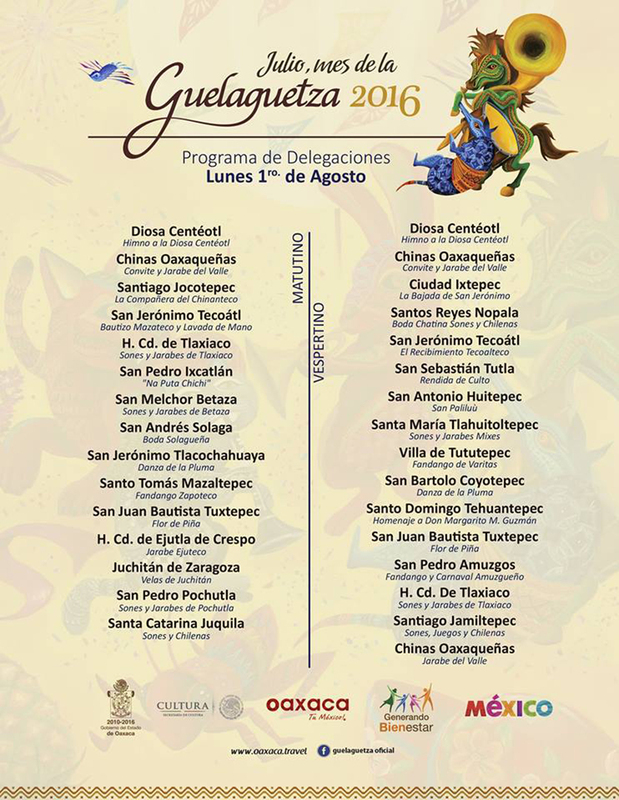 The program of delegations for Guelaguetza 2016 is out and, according to all reports, the show will go on! 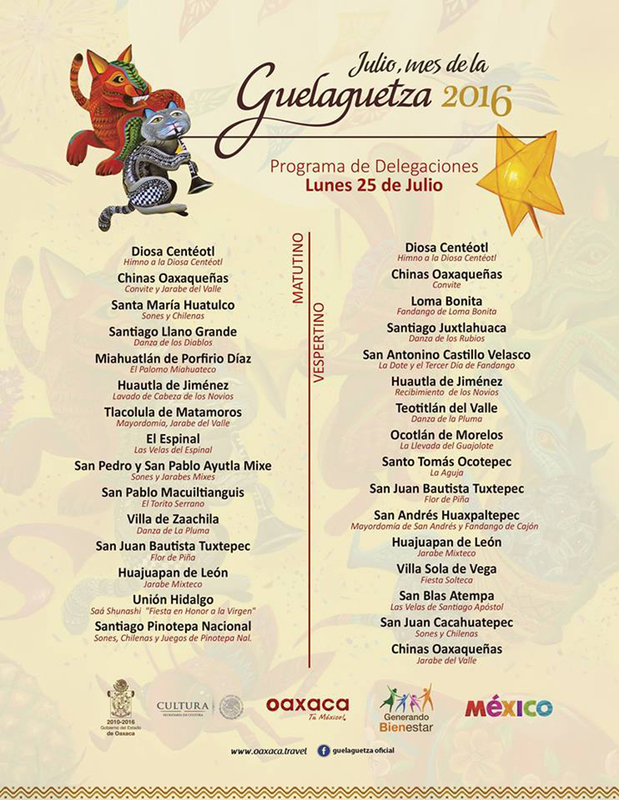 And, at long last, this year the Danzantes de Promesa from Teotitlán del Valle have been invited to perform. It was the talk of the village this past weekend; the pride in their history and traditions and in this new group of dancers was palpable. As you can see above, they will be performing on Monday evening, July 25. Though I won’t be there in person, I will be rushing home from the Guelaguetza celebration in Reyes Etla to watch the live TV broadcast. Hopefully, as in past years, both the morning and evening performances on both Mondays will be live-streamed. I will post the link, once I know. To whet your appetite, here is my short video of the Guelaguetza 2014 performance I attended at the Guelaguetza Auditorium on Cerro del Fortín. If this tempts you to come, please do! Hotels have experienced a 32% cancellation rate, so you should have no trouble reserving a room. And, the restaurants and artisans could really use your support. While there are only a few reserved seats available through Ticketmaster at the performances up on Cerro del Fortín, local communities in the valley host their own Guelaguezas that are small, free, and provide an up-close and personal view. In addition, the delegations dance their way through the streets of Oaxaca on the two Saturdays prior the performances, there are artisan ferias and food festivals in the city and surrounding villages to experience and enjoy. Three marches are happening in the city today supporting Sección 22 of the CNTE (teachers union). Beginning at 9:00 this morning there was one by students and another by the health sector — I saw the latter pass as I took my laundry to the lavandería around the corner. Then, this afternoon there is a “Marcha Pacifica Punk-Libertaria” — whoever they are. And, there are supposed to be “negotiations” in Mexico City late this afternoon between the Interior Minister, Miguel Ángel Osorio Chong, and the CNTE negotiating committee. Hoping for progress, but not holding my breath. That’s it for today’s on-the-ground reporting. I will leave you with a music video. The song is by Los Angeles based La Santa Cecilia and the video was posted by the Oaxaca based, Oaxacking. And, while you’re at it, I highly recommend watching a couple of La Santa Cecilia’s other music videos. Ice El Hielo will probably bring tears. And, I guarantee you will never again hear Strawberry Fields Forever the same, after seeing their version. The rainy season has come and with it, the emergence of chicatanas (also known as, tzicatanas) — a pre hispanic insect delicacy in this corner of the world. 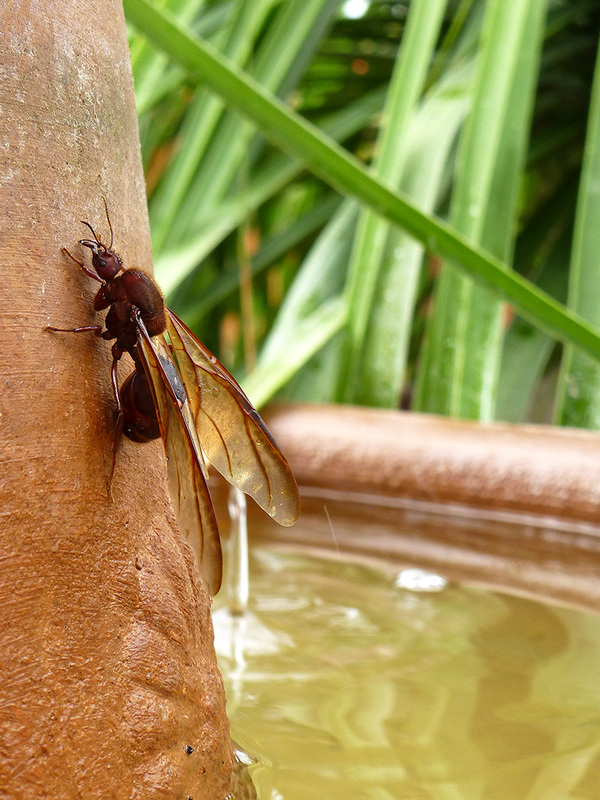 My first experience with these giant “flying ants” was at the Oaxaca airport five or six years ago, where I was greeted with, what can only be characterized as, an infestation. They were flying through the terminal, crawling on the floor, and being chased by toddlers to teens, as adults watched in amusement. Since then, I’ve come to know and even love these little critters — especially in salsas and mole. Two years ago, I awoke to my own infestation on the terrace. However, yesterday morning only a lone female chicatana put in an appearance. Darn, just when I’d actually considered gathering them up like these children and attempting to make chicatana salsa! Monday, I returned to Oaxaca following a mini-vacation to the state of Jalisco to visit mi amiga J in Ajijic and to attend the annual Feria Maestros del Arte in Chapala. It’s a nice place to visit, but I must admit, its appeal escapes me. I guess I’m spoiled by Oaxaca’s countless charms, like today’s “music to shop by” at Mercado Sánchez Pascuas. Muzak, it most definitely is not! Festival fireworks in Oaxaca are usually 3-part affairs, consisting of toritos (little bulls) and/or canastas (baskets) wired with fireworks and worn on top of the head by daring-do guys (toritos) and gals (canastas). This is followed by a castillo (castle) and then the more familiar rockets-exploding-in-the-sky fireworks most of us have craned our necks and oooh-ed and ahhh-ed over since childhood. Sometimes the order of the latter two is reversed. 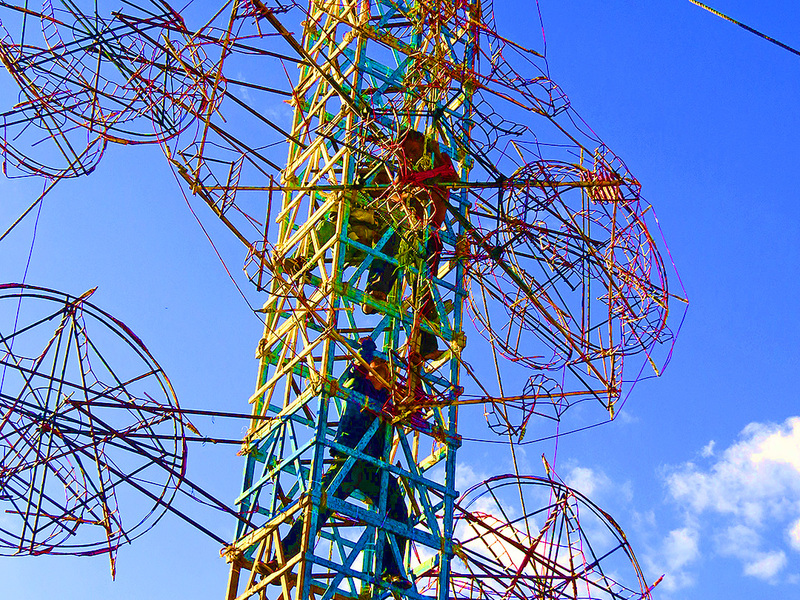 The subject of today’s blog post is the castillo that was constructed and executed this past Saturday by “los maestros pirotécnicos los C. Rigoberto y Dagoberto Morales” for the festival in honor of the Santisima Virgen del Rosario (Sainted Virgin of the Rosary) in Teotitlán del Valle. 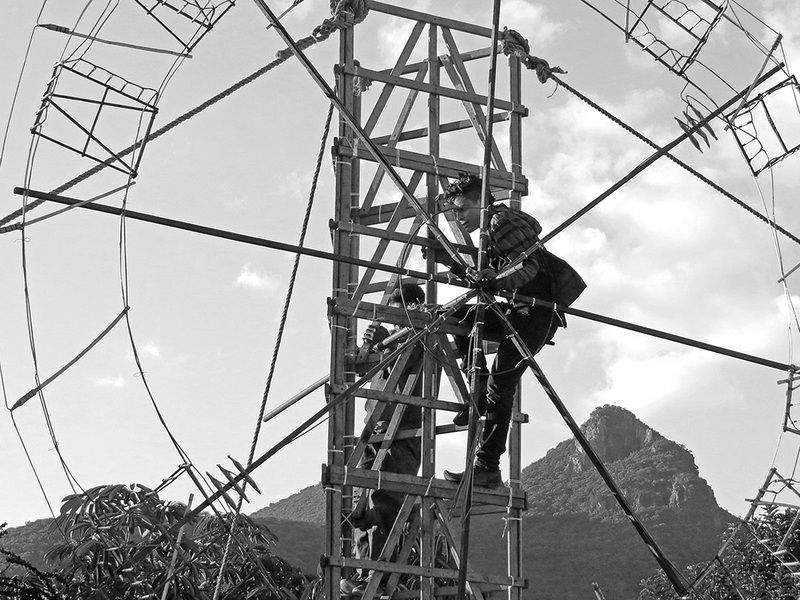 They and their crew went about the business of constructing and wiring this “Erector Set” type castillo out of wood and carrizo in the church courtyard. I couldn’t resist playing with the saturation on this photo. In my mind’s eye, this is the way it looked. And, de-saturating this one against the backdrop of El Picacho, the sacred mountain that watches over the village. The result of the work by these maestros and their crew? A spectacular castillo, accompanied by the band, Herencia Musical. It was quite a show!!! And, if you want to see some inside action from a torito, check out the video Chris made, Torito Danza – Dancing with Fireworks. He actually attached a POV (Point of View) camera to the torito!!! As I’d discussed in a previous post, August 9 was International Day of the World’s Indigenous Peoples. That day, on my way to the mercado, a youth band had me stopping at the city’s cultural celebration on the Alameda de León. This young girl, without accompaniment, brought tears to the eyes as she sang, “Canción Mixteca” by Oaxacan composer José López Alavez. He wrote the melody in 1912 and the lyrics in 1915, expressing his homesickness for Oaxaca after moving to Mexico City. It has since become an anthem for not only Oaxaqueños, but all Mexicano expats yearning for their homeland. NDIKUNI KUI’VI XAA NDOI’ INI. YEE YOI NI ÑO’O, NI ÑAA MANI. How far I am from the land where I was born! I want to cry, I want to die from this feeling. Oh Land of Sun! I yearn to see you!